...THANK GOD I don't work at Initech. Where I do work, we have casual Friday, like every office in America. I'm fairly new to Corporate America and I have found myself struggling with getting dressed, not during the week, but on Fridays. Right before I leave in the morning, my new, shiny apartment looks like a tornado has come though and thrown everything off the racks. My biggest struggle with Friday is staying true to MY personal style but also wearing something appropriate...not that I dress inappropriately, but my booty is too bootylicious to be wearing the jeans that I own to Fridays at work. So I set off for the mall, in hopes of finding something as comfortable as my ripped Jamie jeans. (See MEM's post for her love confession). *A couple hours later* I made it back from the mall in one piece, barely. After making my way in and out of many stores, I have finally decided that work jeans need to be two things: have no distress and be a darker wash. 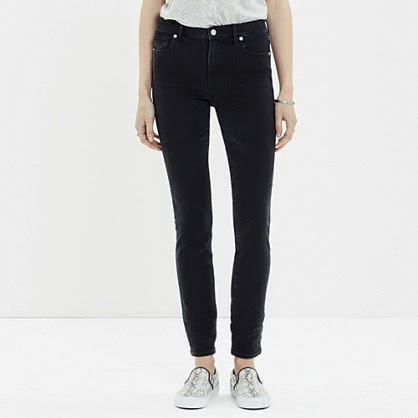 I for one am not particularly keen on dark wash denim so I opted for a pair of black from Madewell. Feast your eyes on the High Riser Skinny Skinny Jean in Lunar. ..Now here are some pics of ME sporting my new threads. They are some of the comfiest jeans I have ever owned, which is good news because I sit at a desk for upwards of 10 hours a day!!!!! YAY WORK. **REMINDER** Do not go the mall on a Sunday afternoon unless you have a death wish.